Niche line Bond no. 9 has launched Dubai Gold, the latest in their series of Dubai fragrances (see Dubai Black Sapphire, Jade and Garnet). Can a fragrance shimmer and gleam? Bond no. 9 Dubai Gold does. Like that most precious of metals, it has a mesmerizing glow. 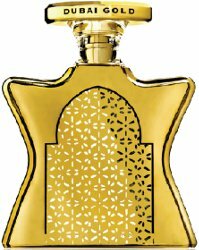 Dubai Gold features notes of brandy, saffron, bitter orange, ginger, cedar, guaiac, amber, sandalwood, musk and patchouli. Bond No. 9 Dubai Gold is available in 100 ml Eau de Parfum, $550. Sorry…cut the rest of this discussion off, and sorry as well to ScentSpirit, meant to edit your comment but deleted it by accident. Anyway, let’s just not go here, ok guys? I don’t want to rate the relative merits of whole countries or regions, it’s just stirring a pot we don’t need to stir. No need to apologize, I absolutely agree with you, I just couldn’t help myself. $550?!?! Hahahaha. I agree with what was deleted even though I didn’t read it. In addition — to borrow a line from Monty Python — I fart in the general direction of Bond no. 9. Nothing in the comment policy prevents anybody from farting in the general direction of any perfume company. Oh Monty Python, good times!